Now that I'm starting to get more into the autographed memorabilia game, my radar has become more finely tuned to pick up on various opportunities in my area. 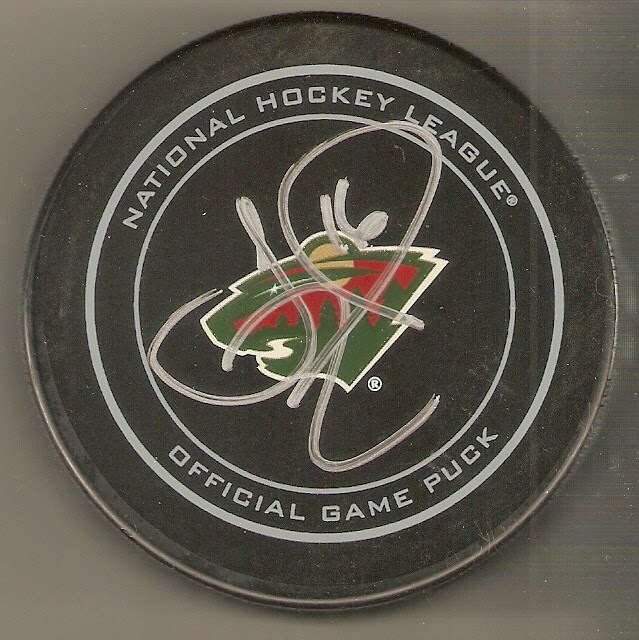 One such opportunity came last Saturday, when Jason Zucker was doing a signing at AME Sports in Roseville, MN. There were two problems, though. For one, Roseville is a suburb of Minneapolis, and about a four-hour drive, and not only that, but I had to work that day anyway. Luckily, they were willing to process orders through the mail, provided that you sent your item in, and included the $10 autograph fee, as well as return shipping. I had a Wild puck in my possession already, so I sent it in, along with the required fees & return postage, and today, I received it in the mail. The puck is one of the official game ones (not game-used, though), which gives is a decent amount of black space. Zucker used either a silver paint pen or a silver Sharpie, which stands out great on top of the background. Also, he may not have a legible signature, but it is distinctive, and he did manage to fill the space with it. I first visited AME Sports last spring, when my wife & I were on our way back home from the Wild/Penguins game. I purchased a few puck cases then, but this is my first autograph purchase from them. Their customer service was great. I did most of my correspondence through their Facebook page, and all of my questions were answered promptly. I also liked the fact that the price you pay by sending your stuff through the mail is the exact same as you would pay if you were there in person. I'll be heading up to AME on the 20th of this month for their 1st Annual Minnesota Sports Holiday Show, where they have Minnesota athletes from hockey, baseball, football, basketball, and boxing. There will definitely be a major haul for me to show of at the end of that day, and I will certainly be posting the photos as soon as I am able to.